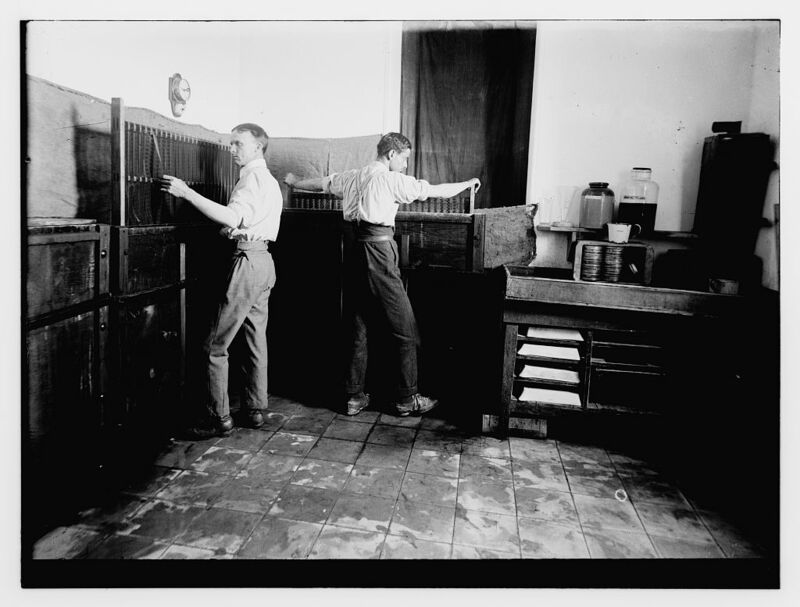 Among the 22,000-plus images of the U.S. Library of Congress’ Matson Collection, only a handful actually show the Colony’s Photo Department personnel at their craft. The reason is simple: They were usually right where they were supposed to be–behind the camera, or hard at work in the darkroom! However, around 1920 the American Colony Photographers, and department head Hol Lars “Lewis” Larsson in particular, made a little-known foray into the emerging medium of motion pictures, an interest that arose through Larsson’s contact with a Swedish filmmaker. The Colony acquired their own camera, and cinematography, at least for awhile, apparently became an important aspect of their work. Someone obviously thought the activity unusual enough to create this series of images documenting Lewis Larsson and the Albina brothers, Gamil and Najib, processing lengths of motion picture film. Their technique involved winding the exposed film onto specially-built racks which were then transferred by hand through a series of watertight tanks; the processed film was finally removed from the racks and wound on a giant spool for drying. Most of this equipment was of wooden construction, no doubt crafted in the Colony’s own carpentry shop. 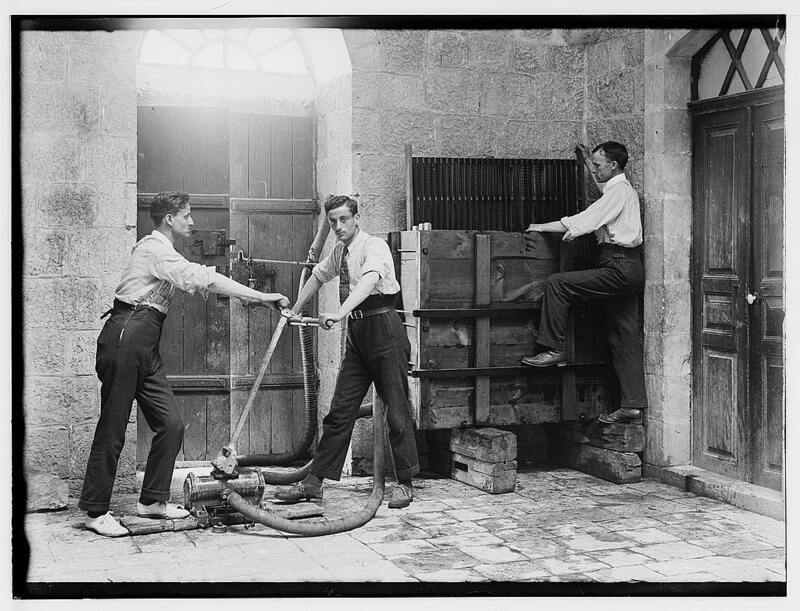 In the TOP PHOTO, ABOVE, the Albina brothers man a hand-operated pump, circulating water through the wooden tank, where Larsson stands lifting a rack loaded with film. This would likely be the film washing process, after development–note the light streaming in over the doorway! In the NEXT PHOTO, Lewis Larsson and Jamil Albina have carried out the initial developing and “fixing” of the film, under darkroom conditions. 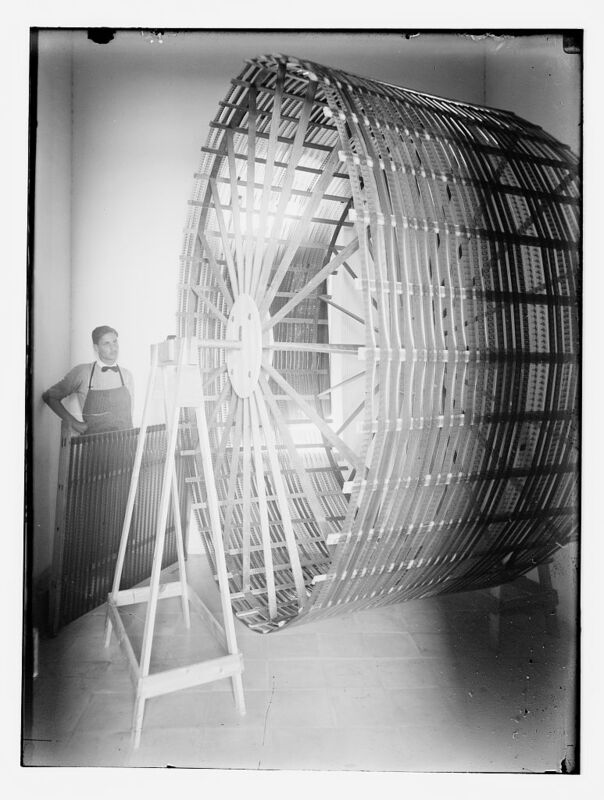 BELOW, Jamil Albina stands next to the huge wooden spool for air-drying the lengths of processed film. Jamil Albina (1898-1963) and Najib Albina (1901-1983) belonged to one of Jerusalem’s prominent Christian-Arab families, and at this time seem to have been employees (perhaps apprentices) of the American Colony’s Photo Department. As such, they were not members of the Colony community. Later, in the 1930s and ’40s the two brothers went on to operate a Jerusalem photographic studio together, located on Julian’s Way (today’s King David Street). After 1948 both continued their photographic careers, but separately: Najib was associated with the Rockefeller Museum in East Jerusalem, where he did pioneering work imaging the Dead Sea Scrolls, while Jamil lived and worked in Amman, Jordan, carrying out photographic projects for the American Embassy. As for the finished films themselves, most were probably done under contract for paying customers (perhaps without attribution). A few others, however, are of events and activities shot on the American Colony compound–a bit like “home movies”. After falling into obscurity for many decades, these have come to light in recent years–right on the Colony grounds!–and are now among the holdings of the American Colony in Jerusalem Archive. 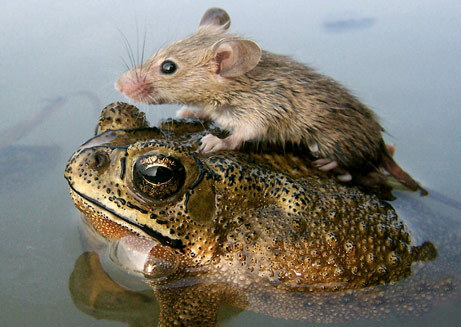 Another photo I have just become aware of! 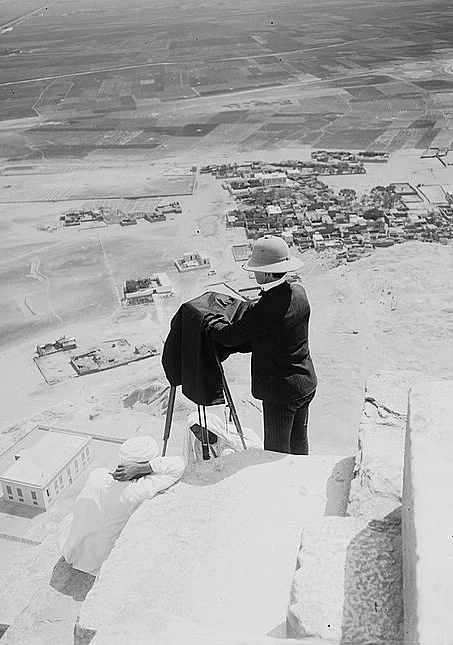 This one shows Eric Matson photographing the ancient Nabatean city of Petra in 1934. The Library of Congress lists the creator of the image as “Matson Photo Service”– but who was the photographer taking Matson’s picture? We don’t know! From the above attribution, it would seem that by this time Matson had already left the American Colony community, which occurred that same year, 1934. Thereafter, he operated his own outside commercial studio, but still using (with permission) the name “American Colony Photo Dept.” It was only ca. 1940 that the split was final and the name “Matson Photo Service” came into use. (NOTE: when the LOC was first cataloging these images several years ago, these nuances of the separation were still unknown). This is one of a series of posts I hope to do highlighting images produced by the Photo Department of the American Colony of Jerusalem (and later by Eric Matson, working independently), between about 1897 and 1946, as well as other aspects of Colony history. The springboard for some of these posts was work I did in collaboration with Todd Bolen on his digital publication project of American Colony/Matson images. For more background on the Colony, see my on-line article “Jerusalem’s American Colony and it’s Photographic Legacy“. This entry was posted in American Colony, JERUSALEM, Photography and tagged American Colony, Egypt, Eric Matson, Furman O. Baldwin, Jamil Albina, Jerusalem, Lewis Larsson, Library of Congress, Matson Collection, Najib Albina, Petra, Photography, Pyramids. Bookmark the permalink.